Today, Amazon announced their new Amazon Fire TV Stick 4K. This latest Firestick model is just like the one you probably own already but has been updated to support 4K and UHD streaming like its big brothers, the 4K Fire TV and Fire TV cube. You can preorder the Firestick 4K right now, which officially goes on sale October 31 this year. The very best thing about this new offering from Amazon just may be the new remote control, which sports dedicated volume and power buttons. That’s not the only great new Amazon 4K Firestick feature, though. The new Fire TV Stick 4K does sport a powerful 1.7-GHz quad-core processor and also supports both HDR10+ and Dolby Vision protocols. Working with many Amazon Fire TV products these past few years, including every generation of Fire TV, Firestick, and even Fire TV Cube, I can tell you that having Alexa voice control is a wonderful thing. The need to switch remotes in order to adjust the television volume and power things on or off has been my biggest gripe to date. Of course, I’ve also been known to complain just a little bit about the 1080p Firestick’s WiFi reception. A 4K HDR streaming stick is currently the pinnacle of home entertainment that travels well. Most devices streaming at 4K resolutions with color HDR protocols are in the price range of $70 and above. The Roku Premiere 4K broke this pattern with a $40 price tag. The main problem with the Roku Premiere is its big, boxy design. Actually, I take that back; the main problem is the lack of an ability to install Kodi on Roku. But, I digress. We’d still much rather have a sleek little Amazon 4K stick design. The Amazon Firestick 4K will be the first FireOS product to include volume and mute buttons right on the remote. Rather than having to change over to your television or cable remote, now you’ll be able to control the volume and shut things down right from your Firestick remote control. 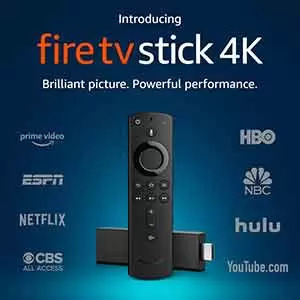 I’ll be adding the new Firestick 4K remote to every compatible Amazon product I own as soon as they are released October 31. Of course, the Amazon 4K Fire TV Cube already has Alexa voice control over volumes, power, and anything else you can control with Alexa. With Alexa remote voice control, you’re able to turn on lights, start your coffee maker, or even make purchases from Amazon. You can even ask Alexa to tell you a joke about milk, and she will oblige. If you’d like to add the new power and volume controls to your 4K Fire TV, Fire TV Cube, or even 2nd generation Fire TV Stick, you can purchase the all-new Alexa voice remote with power and volume controls separately.